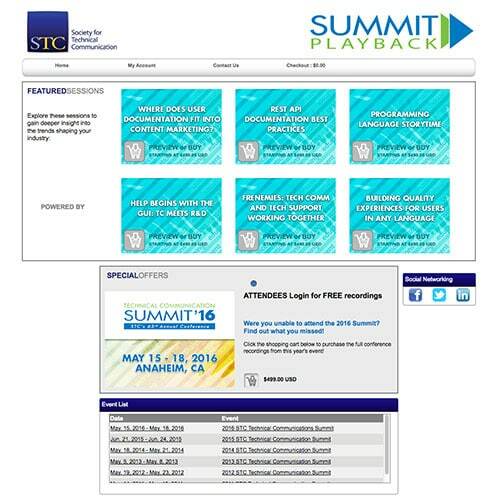 Summit Playback is an online collection of the conference’s content, with audio and PowerPoint synched together. The 2016 Summit included over 80 sessions in seven tracks (see the full program here) and Summit Playback includes almost all of them. Not only does Summit Playback capture the audio and visual presentations of the speakers, but its content can be revisited after the conference to help ensure you stay up to speed between Summits! Summit Playback for 2016 is Now Available! Everyone who was a FULL conference registrant in 2016 is set up to receive complimentary access to Summit Playback through 31 March 2017. If you were a full conference registrant, you should have received an email from our partner MultiView with your Summit Playback username and password. This is the information you will need to use to log on to the Playback website so you can start listening to recordings for free. If you have any questions about your access or problems logging in, please email multiviewmediasupport@multiview.com or call 1-972-910-6899 between 9:00 AM-5:00 PM ET, Monday through Friday. We’ve already created accounts for all STC members, so there is no need to create an account if you’re a current STC member. To access your account, log in to the Playback website using your preferred STC email address as the username and your last name as the password. If that does not work, please click “Log In” followed by “Forgot your Password?” to have it emailed to you. Once you have purchased Playback, you will have access through 31 March 2017. Access for STC members is $199 through 31 August 2016. The price will increase to $249 starting 1 September 2016 through 31 March 2017. You will need to create your own account on the Playback website. Access for nonmembers is $499 and is good through 31 March 2017.